Post by CREATe PhD student Sheona Burrow, announcing adding data from the newest wave of the IP Infringement Tracker to CREATe’s OMeBa online search tool. In July 2017, the IPO published the results from the newest wave of the Online Copyright Infringement Tracker surveys. This is the seventh iteration of the survey, which OFCOM started in 2012 as part of OFCOM’s obligation to monitor online copyright infringement under the Digital Economy Act 2012. The surveys were developed by Kantar Media, using a peer-reviewed methodology, the peer review report is accessible here. The survey developed by Kantar Media, asks people aged 12+ about internet consumption and consumer behaviour online and focuses on six types of online content: music, film, TV programmes, books, video games and computer software. The surveys are delivered both online and face to face and have been designed to gather both direct and indirect reporting of consumer behaviour and illegal activity. The surveys ask more than 500 questions, and therefore collect over 5,000 points of data. While the Reports of each wave of the survey are useful in looking at copyright infringement in that quarter, and OFCOM and the IPO have made the raw data available, there has been no way to compare each data point against previous waves of the survey, unless the published reports have commented on any emerging trends from a longitudinal point of view. To address this problem, and to make the data more accessible and useful for those in academia, copyright-based industries and policy-making, CREATe has developed a tool which allows users to look at the responses to individual questions from Waves 4-7 of the surveys, which collected data from the March-May quarters in 2013, 205, 2016 and 2017, and compare the results to previous waves. The tool OMeBa (Online Media Behaviour Analytics) was developed by Kristofer Erickson, Martin Kretschmer, Jesus Rodriguez-Perez, and Theodore Koutmeridis in 2016 and the data from the newest wave in 2017 has recently been added to this. You can access OMeBa here. 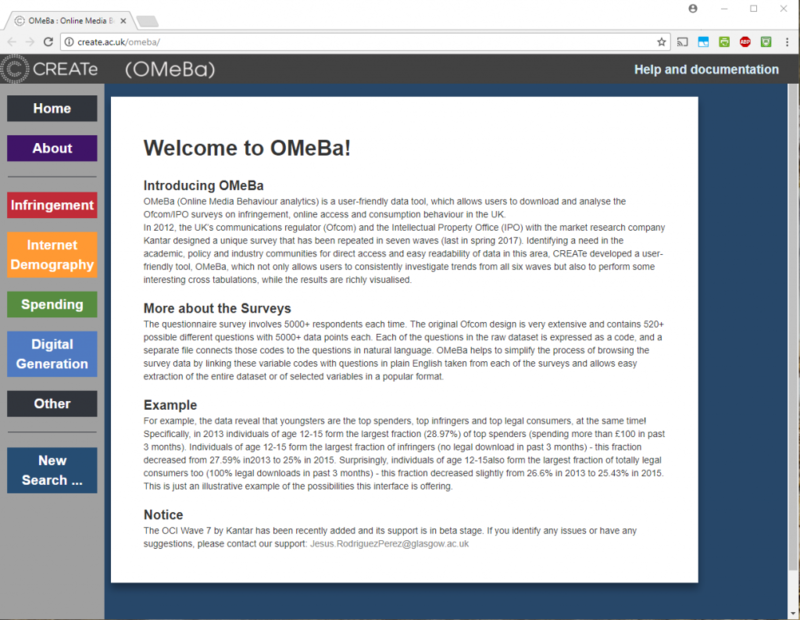 We have created a Resource Page with more information about OMeBa and examples of how is can be used to explore the data collected in the OCI Tracker Surveys. Or simply try OMeBa for yourself.